The nice thing about IKEA furniture is that it is cheap and easy to hack. In other words, lets say that you were to buy two Gorm shelving units and assembled them to discover that one was crooked. 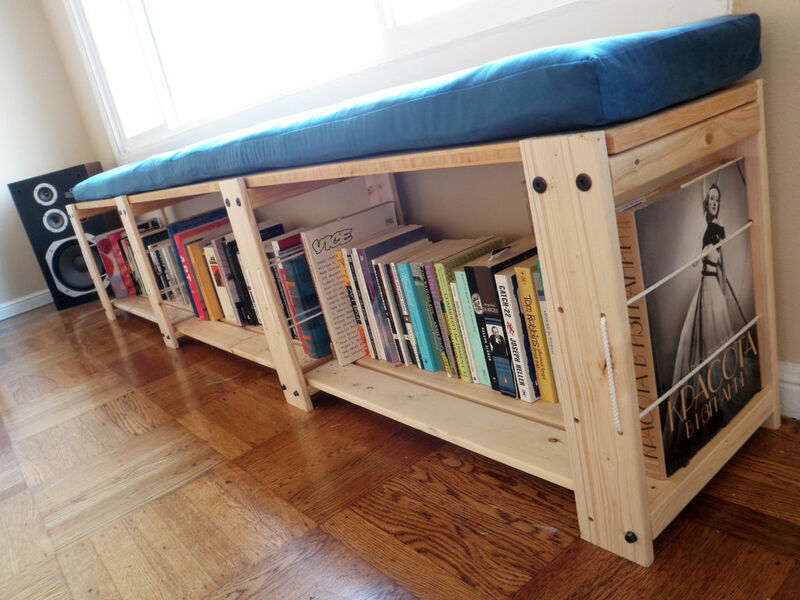 Well then, it would be really easy to spend an afternoon converting the crooked one into a solid, stylish and symmetric bookshelf bench. As you probably just guessed, this Instructable will show you how to convert a shelving unit into a bookshelf bench. With a few extra peices of hardware and a couple of basic power tools, you could be on your way to relaxation and organization all at the same time. Update: You can no longer buy these types of shelves directly from Ikea, but you can still get them second-hand. Alternately, you can try converting one of Ikea's newer shelving systems. Assemble your Gorm bookshelf to realize that two out of the 4 posts are crooked. Stare at it in displeasure. Resolve to take drastic actions. Cut four 12.25" lengths of 2x4. With a 3/8" drill bit, drill holes in the ends of the 2x4 such that they are 3/4" in from each edge (top, bottom, left and right). Also drill holes on the flat surface of the board that is 2" in from the far edge and is perfectly aligned with the hole you first drilled. In other words, this hole should intersect at a 'T'. Disassemble your horribly crooked bookshelf. Select the two prettiest and straightest beams to cut up for use as the supports for the bench. You will be able to make six supports with these two beams. Using the two ugly beams, you should be able to get 1 support from each. Cut one of the nice-looking bookshelf beams starting from the bottom edge (edge that used to be on the floor) and cut it to a height of 18.25". Next, take the first piece you cut and line up its holes with the holes on the new bottom edge on the board. Make a mark on the longer board at each end of the first cut beam. Using the two lines you just drew as cutting guides , make two cuts. You should now have a second beam. Now, use the first beam to line up to the holes on the opposite side of the board and make cut marks as appropriate so they are all the same size. Cut at these markings. You should now have 3 beams. Repeat this process on the second pretty looking beam. Next grab the two ugly-looking beams. Measure in from either the bottom or top edges (whichever edge looks best) of both ugly beams and make one cut on each to produce two more 18.25" beams. You should now have eight 18.25" beams with all of the holes lined up. Sand and smooth any rough edges you may have from sawing and/or drilling the 2x4 or bookshelf beams. Insert cross dowels into the four holes drilled through the surface of the 2x4 sections. Depending on the tolerance involved, this may require driving the crossdowels into the holes with a hammer. To push it in beyond the surface of the board, place a screwdriver or chisel atop the crossdowel and slightly tap it with the hammer. Make certain that the slots on the crossdowels are all facing the same direction inside the board. Using the Ikea hardware, attach three shelves to the lowest holes in the bookshelf beams. Next, using your 2.5" bolts and crossdowels, attach the 2x4 sections to the topmost holes of the boards. Flip your bookshelf bench upside down so that it is perfectly aligned over the top of your plywood. Drill two 3/32" pilot holes in each of the 2x4s such that it goes all the way through into the piece of plywood. Using your woodscrews, fasten the plywood to the 2x4. Make sure you apply a lot of pressure downwards while drilling so that the two surfaces are fastened tightly flush together. Thread rope through the extra screw holes in the boards to serve as book ends and keep books from falling off the ends or through the cracks in the middle. Basically, on the two ends, you should tie a knot and pass the rope through to form a rectangle. Once all the way through, pull it tight and tie the rope together so that the rectangle is closed. The middle sections are slightly trickier, but basically you do the same thing, but rather than closing the rectangle by tying it shut, you start to pass it through again from the back to form another rectangle. Once done, you pull it tight and tie the end of the rope to the knot at the beginning. This will create two sets of two parallel ropes and two "vertical lines" in the front, which will aesthetically match the two ends. Arrange your books on the book shelf. You may want to consider placing larger books towards each end to make sure the rope doesn't accidentally let smaller books slip through. Make yourself a nice comfortable cushion as outlined in the this Bench Cushion Instructable. Dowels would be a nice solution. Very stable and classy looking. We lost all our Gorm shelving screws in our last move! Worst thing that happened. Ikea sells 4 screws for $9.90 plus shipping, but need about 50. What size do I need as a replacement? Figure it must be metric. Any help from the Instructables community is MUCH appreciated. Thanks. if you need a shoe rack, replace the silly black screws by ~15cm long counter-sink bolts that run with their heads evenly into to the planks and use wooden angles cut to 45° (Pythagoras helps out measuring the longer sides of these trapezes) for stability of the construction before screwing all to a wall - i'm too lazy to write an ible for this; i build all my boards like this, cheaper than buying angles from the hardware store. Dope flat pack hack you've done there! The crooked bookshelf you've assembled has turned out look absolutely awesome! Montage looks clean and stable, all steps are clear and easy to follow. This is how you do furniture assembly the right way! I myself would personally even change to bookshelf colour but RAW is beautiful as well! Ikea assembly services can only envy you! You could be a pro! I Made it. Nice solution. Thanks. What weight will it support? I love this! but i need a specific size for my project (70"W x 20"H). Could you let me know for certain? Thanks! Im from France and I have to convert all those measures to european system. Anyone knows what size of lumber in centimeters is a "2x4" ? Is it 1.5 in × 3.5 in so 3,8 cm × 8,9 cm ? Could someone tell me the size of the heads on the hex bolts? Even Ikea doesn't know...I need to break some down in my storage space and I don't want to lug a full ratchet set. How long is that in cm? how do you get 4 12.25" pieces from a 48" piece of wood. doesn't that total 49". should it be 12" inches each?